Clinical-strength probiotics, with revolutionary prebiotic & postbiotic nourishment, boost immune defenses and promote digestive health. * Learn why this triple blend is a major advance in probiotic supplements. Probiotic All-Flora delivers 5 billion CFU (colony forming units) of friendly bacteria and 5 billion CFU of beneficial yeast that work in synergy to balance your total microbiome. Our formulation is optimized to support healthy immune defenses and promote digestive health including bowel regularity and the reduction of occasional gas, bloating, diarrhea, and constipation. * All in just one capsule daily. Great for travel and times of GI distress, too. Shelf-stable, no refrigeration required. If you’re seeking the best probiotic for women and men, you want a combination of proven effectiveness and excellent quality. Probiotic All-Flora is formulated with probiotics in clinically relevant amounts that work. 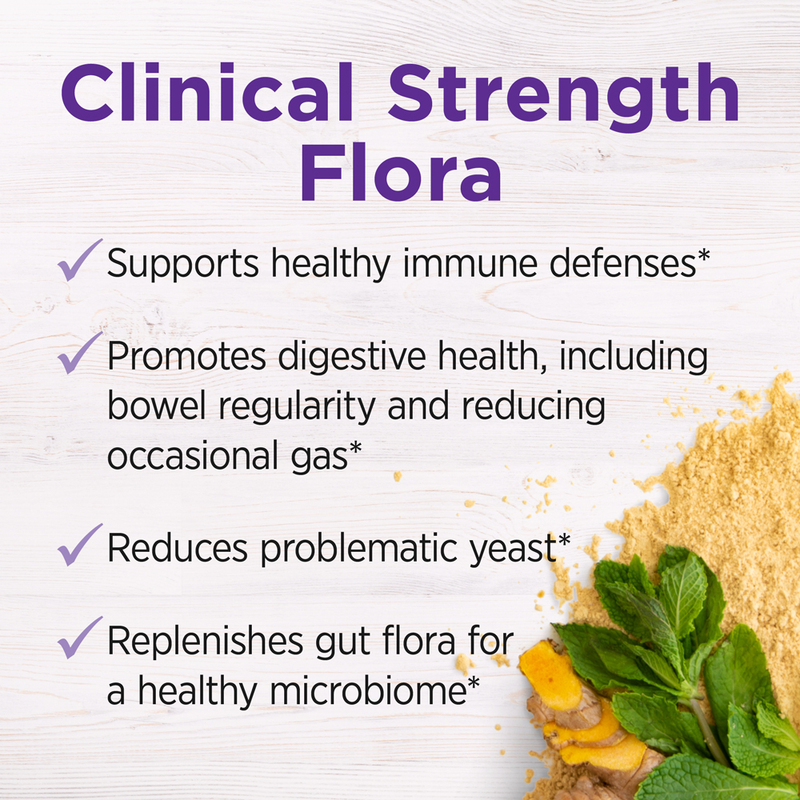 A revolutionary approach to total microbiome health, Probiotic All-Flora delivers two types of clinical strength flora: friendly bacteria and beneficial yeast. Our probiotics are DNA-tested to assure quality and identity by delivering the exact, researched strains every time. The rebalancing yeast provides a more complete approach to supporting gut flora than just having friendly bacteria alone—since our gut is home to both bacteria and yeast species. Our Well Shield™ science proves that Probiotic All-Flora works at a cellular level, setting off a positive chain reaction for overall health and longevity. Certified Gluten Free by NSF; 100% vegan; no artificial flavors or colors.